Add chicken and hot sauce to a skillet over medium high heat. Add cream cheese and ranch dressing and stir until fully combined. Transfer to a small crock pot and set to low. Top with remaining cheese and serve when hot and bubbly. Change up the Ingredients: Try sprinkling Bleu Cheese Crumbles on top. Make several versions of this dip, one Hot, one Mild, even Barbeque. This Recipe Can be Doubled: This is a great recipe for a crowd. 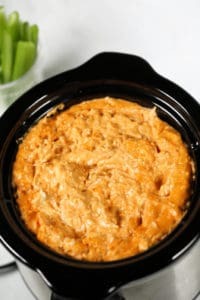 Simply increase the ingredients proportionately and place in a large Crock Pot or two small ones to spread out the goodness at larger functions. Serving Suggestions: Try serving with celery, carrot sticks, crusty French bread, or corn chips.